The study was inspired by a gas explosion in a Mexican maternity hospital in 2015, caused by a leaking gas storage tank, says postdoc José Federico Hernández-Sánchez, who carried out the research with Alghamdi in Sigurdur Thoroddsen's lab at KAUST. "The explosion in the hospital happened far from the leak, which is very common in these types of accidents because the explosive clouds are unpredictable and may move through windows and doors until finding a spark," Hernández-Sánchez says. Understanding the explosive clouds formed by flash boiling fuels has been difficult until now: flash boiling occurs too fast for capture by traditional high-speed cameras, which typically operate at up to 12,500 frames per second. 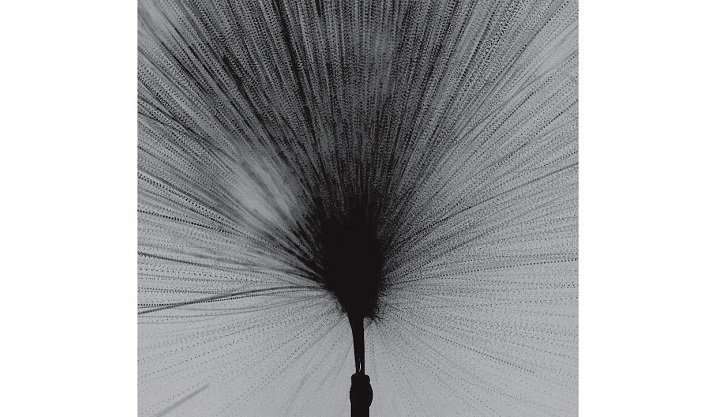 "In most reports about flash boiling, every picture of a spray shows blurred motion," Hernández-Sánchez says. The blur masks behavior with potentially significant implications, Alghamdi and Hernández Sánchez have now shown. 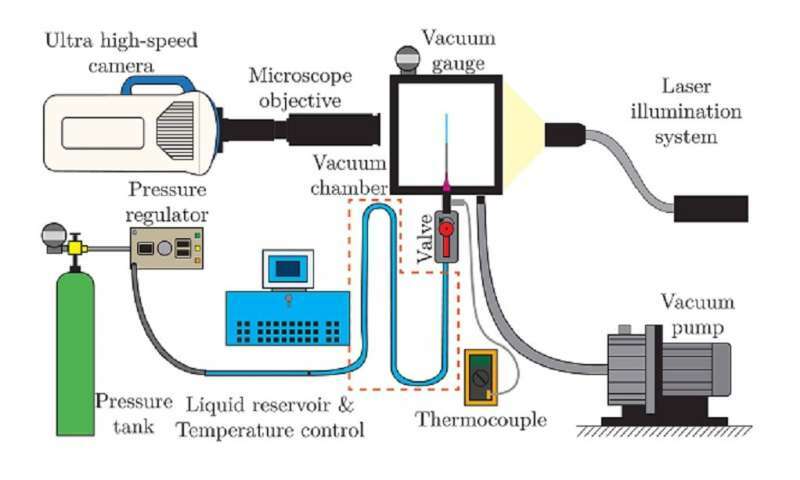 "It took us three months to design, construct and optimize the experimental setup," says Alghamdi, who built the setup.The team used a camera capable of capturing five million frames per second, fitted with a microscopic lens, which they aimed at a jet of compressed liquid being released into a vacuum chamber. The camera captured sharp images of flash boiling, which the team could use to accurately measure the ultrafast phenomena taking place. "We measured bubbles expanding at up to 140 meters per second. I do not think high-speed expansion has ever been reported at this rate for a bubble," Hernández-Sánchez says. More significantly, the team could also observe what happened once the bubbles burst. "The bubbles that disrupt a flash-boiling jet have remained unseen due to their extremely rapid speed of expansion. We visualized them and observed that after the expansion, the jet breaks into a polydispersed spray," says Hernández-Sánchez. 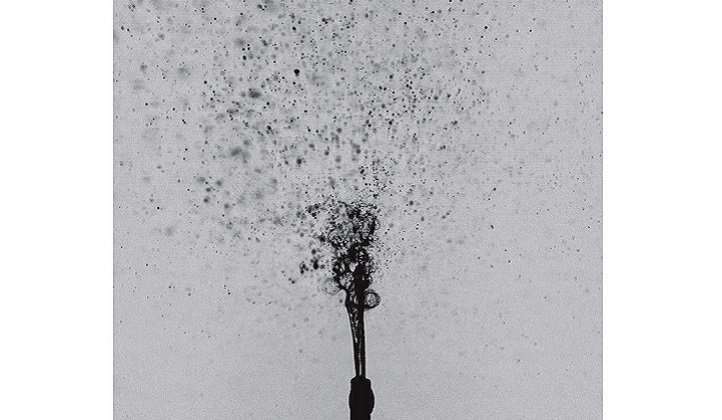 The explosive cloud of tiny droplets spreads almost 360 degrees around the end of the nozzle—a much larger spray angle than previously suspected. "Many numeric simulations have attempted to predict the propagation of explosive clouds," Hernández-Sánchez says. But they have all failed because they missed the speeds of propagation of the gas, the real direction where the fuel is going, and the polydispersity of the spray. In our study, we address all these missing ingredients."